While NASA continues to chase its tail in the search for water on present-day Mars, planetary geologists have been arguing for decades about the possibility of an ancient northern ocean on the red planet. The debate started with the Mariner images of Mars from the 1970s when it became pretty obvious that the Martian surface was divided into two principal terranes, the Southern Highlands and the Northern Plains. The primary observation that the Highlands were riddled with far more major impact craters than the Northern Plains made it pretty clear that the surface of much of the martian northern hemisphere is significantly younger than that of the southern hemisphere, and the ensuing debate focused on how to resurface the Northern Hemisphere after the formation of the old martian crust now preserved in the south. Two principal hypotheses have captured most of the attention : (i) either that the Northern Plains represent the equivalent of a giant lava-filled Impact Basin, similar to the mare on our Moon, making it the largest such impact basin in the Solar System; or (ii) that the Northern Plains represent a lava-covered floor of an ocean. A recent paper in the magazine "Nature Geoscience" suggests that we can now support the existence of an oceanic-size body of standing surface water in the Northern Plains. So let’s take a look at that geoscientific evidence - and let me tell you from the outset, it looks pretty good. However, before we do, let's ask ourselves the question : "How do you identify an ocean on a dry planet ?" ,On Earth, it's pretty straight forward; an ocean is a body of standing salt water that's made up of local components - referred to as "seas". The way we delimit the ocean is even simpler - we trace out its shoreline (admittedly the boundaries between oceans are a bit more complicated, but for planetary purposes we can simply state that the Earth has an ocean - and have done with it). But how do we identify sea-level if we take the water away ? Don't be fooled by this image. Look at it through the eyes of inter-stellar aliens - at some time in the distant future - who are trying to figure out if Earth ever had oceans or not in its earlier history. Suppose these aliens were highly skeptical; what would it take to prove to them that those blue lowland plains in this image were once ocean basins ? The traces of plate tectonics in the basins – the mid-ocean ridges, the transform faults and symmetrical alternating magnetic stripes (not shown here) - tell you how the basins formed, but they don't tell you anything about the presence or absence of water - enough water to fill those basins and turn them into real bona fide oceans. So what evidence do we need to convince the aliens ? Deltas ! #1 : Rivers flow, and some flow to the sea. #2: Rivers carry sediment (sand and mud) while they are flowing. #3 : When river water reaches the sea/ocean it hits what is by definition a standing body of water. #4 : From the river water's perspective, it just hit a wall, so it slows down and stops. #5: As the river water loses speed, it loses it ability to carry sediment and drops it onto the sea floor immediately adjacent to the shoreline. #6 : Because the river water is slowing down at the shoreline, the main river channel divides into a braided system of channels in order to evacuate the same volume of water in the same time as the water is headed downstream in the main river channel inland, hence the river system now has a delta shape, with the pointy end of the delta pointing back upstream. #7 : When the braided river drops its sedimentary load, those sediments will also have a delta shape, which will survive even if you remove the water at some later stage. #8 : Rivers - by definition - tend to meander when they are flowing slowly, so it's no surprise to see that a real delta like the Mississippi has built up as a series of deltas that overlapped and piled up one on top of another over time (~10,000 years). These 8 steps in delta formation lead to an obvious conclusion : deltas by definition mark local sea-level, and a series of deltas of the same age will mark locations of the same sea-level over a wider area, and because deltas are accumulations of river-borne sediment, they will mark sea-level even in the absence of the water associated with their formation - including the sea/ocean. I think you can see where we're going to go with this on Mars ... but let's look at a couple of terrestrial deltas first. Here's the Nile Delta in Egypt, at the north end of the Nile River where it meets the shoreline of the Mediterranean Sea. Unlike the Mississippi Delta which is made up of a series of smaller deltas of different ages, this delta is a single long-lived accumulation of sand and mud that retains a classical delta shape. This is a false colour image of the Lena Delta in Siberia, at the northern end of the Lena River. The different colours correspond to different sedimentary materials that make up the fan-shaped delta. Here you can readily see that the active braided streams are mostly confined to the East, while the isolated round lakes and ponds to the West are located in an older, currently abandoned part of the delta. Now let's return to the Mississippi delta in the SE US. As you can see in this satellite image and the accompanying inset, this delta does not have a simple fan shape. The easiest part to identify is the currently active delta (circled). See how it looks like a "Bird's Foot" surrounded by submarine sand deposited by the river. If we now outline the successive components (1-6) of the entire Mississippi Delta as it was built up over time, we can see how it's a composite delta made of many fan-shaped components, and that the "Bird's Foot" is just the latest manifestation of delta construction. What has all this got to do with the occurrence of ancient oceans on Mars ? Well, the question really is - "are there deltas on Mars and can we identify them ?" The answer is a resounding Yes! Here I've juxtaposed the Indus River Delta in Pakistan with part of the delta from the Holden NE Crater on Mars, located off the eastern end of Valles Marineris. Notice how both have an overall fan shape in which we can see the traces of multiple river channels formed by the braiding of rivers flowing from the left. In the Indus example, those channels are low-standing and filled with water, but in the martian example they are high-standing wiggly ridges made of consolidated sand and gravel that resisted wind erosion that has removed much of the mud that was laid down between the river channels (leaving a negative image of the delta). Note the absence of scale bars here; these deltas are not the same size - the martian example is much smaller. However, that doesn't matter because the important thing we want to establish here is whether delta-forming processes have occurred on Mars, whatever the scale. This abstract looking object is a perspective rendition of the complete Holden NE (or Eberswalde) Delta. It turns out that only the northern part has a classical fan shape; the rest of it is more of a series of "Bird's Foot" shapes, very reminiscent of the Mississippi Delta on Earth. Here's another example of a martian delta in Jezero Crater, located just east of Syrtis Major, with false colour to highlight different kinds of sediment (sand vs mud mostly). This is an intriguing combination of a classical fan-shaped delta overprinted by a late-stage set of river channels flowing from the left that form a "Bird's Foot" feature. These two martian deltas are the ones for which I could find good quality images. However, they both occur in craters, which means they are deltas that formed along lake shores, not the shores of an ocean. That's not a problem for us though, because I wanted to use them to show you that delta-forming processes have occurred in martian geological history. Here's a map of the planet-scale distribution of martian deltas used by the authors of the "Nature Geoscience" paper. The red squares represent deltas interpreted to have formed at the margin of the Northern Plains (ocean ? ), and altimeter measurements show them to sit at heights within a few 100 metres of each other. In other words, they mark an ancient martian sea-level. The other symbols represent deltas formed within craters (lakes). The fact that only one third of the known deltas appear to be associated with the boundary of the Northern Plains might explain why the best images of martian deltas are from within craters. Nonetheless the red squares do appear to trace the boundary between the Southern Highlands and the Northern Plains, except around the Tharsis Uplift. This is an interesting observation which also shows up in this diagram of the distribution density of river channels within the highlands, with the highest densities indicated by yellow and red colours. The northern limit of the channels represents where rivers that did not necessarily form deltas reached the northern ocean, and ended. Notice how the northern limit of channels corresponds to the highland/lowland boundary, except in the vicinity of the Tharsis Uplift. This disturbance in the distribution of deltas and river channels around Tharsis tells us that the highland/lowland boundary in this region is the result of the Tharsis Uplift history, rather than an undisturbed ocean shoreline. 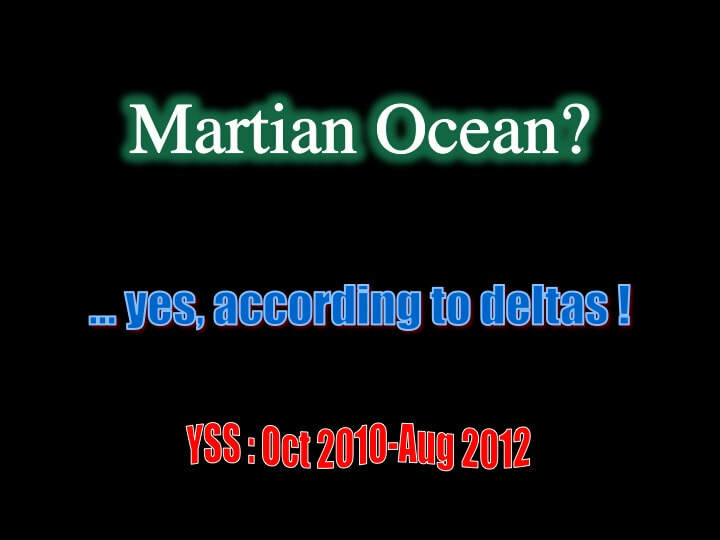 So, for the time being, it would appear that the martian ocean hypothesis is once again in the ascendant. But let's keep this likely martian ocean in perspective. Earth is relatively large and endowed with sufficient water that 75% of the planet is covered by ocean. Mars is much smaller than Earth, and we're talking a smaller ocean covering only about one third of the planetary surface. Most importantly, we know that ocean basins form on Earth as continents split and drift apart in that global process known as "Plate Tectonics". On Mars we do not have a clue as to how the Northern Plains might have formed as an ocean floor, and the issue is all the more complicated by preliminary observations that the material beneath the Northern Plains might be identical to the Southern Highlands; the very antithesis of Plate Tectonics ! In short, planetary scientists are making good progress in understanding the geological evolution of the martian surface, but they've not got it all solved yet !